You cannot purchase a higher quality air cushioned background support system anywhere at this price, we guarantee it.This is a high quality air cushioned PBL background support system with a 12ft two section twist crossbar and 10ft stand, holds 15lbs. This durable support system is made from light weight aluminum tubing. The stands with this system are air cushioned to prevent the cross bar from free failing. The rubber tips on the legs prevent movement. 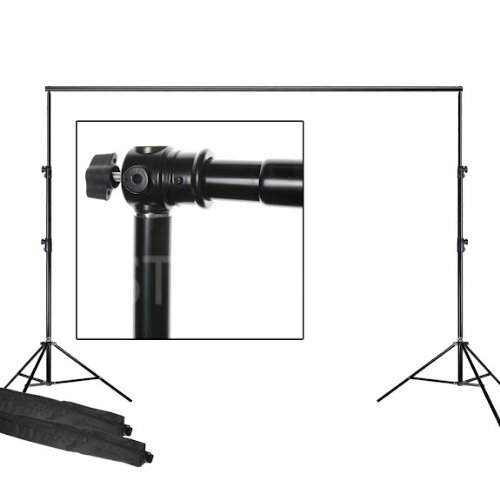 This support system can be used on location or in your studio. Crossbar extends from 6ft to 12ft, tightening knobs built into the cross bar keeps bar from falling off of stands Holds canvas,muslin or paper up to 12ft wide.This is a professional background support system that will give you years of service. If you have any questions about this product by PBL, contact us by completing and submitting the form below. If you are looking for a specif part number, please include it with your message.